1.This is a modified sine wave series inverter, NOT applicable for air conditioners, refrigerators and microwave ovens, please choose our pure sine wave inverters. 2.The highest out put power must be under 200 W. If the power inverter is directly connected with the cigarette lighter. 3. If the out put power of the inverter is higher than 200W, we strongly recommend you using the Crocodile Clips to a battery (clips are included) but not the cigarette lighter, because your car cigarette lighter might not afford power over 200W. 4. When using reactive load appliances, the start power will be 2-5 times of continuous output / rated output power, but must be lower than start power of the inverter. 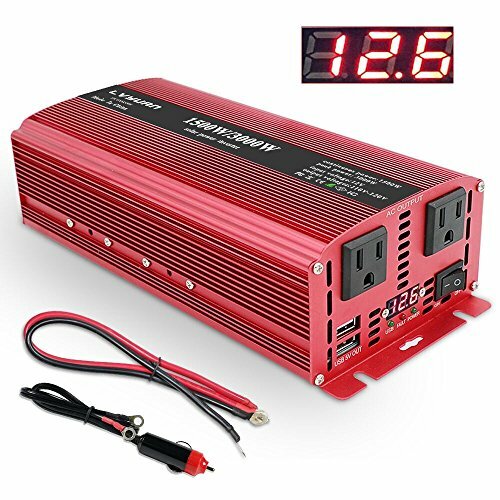 5.2000W is the peak output power of this inverter. The continuous output / rated output power is about 45%~60% of the peak power. A Real Powerful Inverter: A newly developed inverter with sufficient power can use Blenders, vacuums, power tools.Working on the way and everywhere, where is no electricity! Superior Endurance Performance: Durable construction and quality material stands up to harsh environments and all season, ideal for use on road, at campsites, remote job sites or anywhere that AC power is needed.